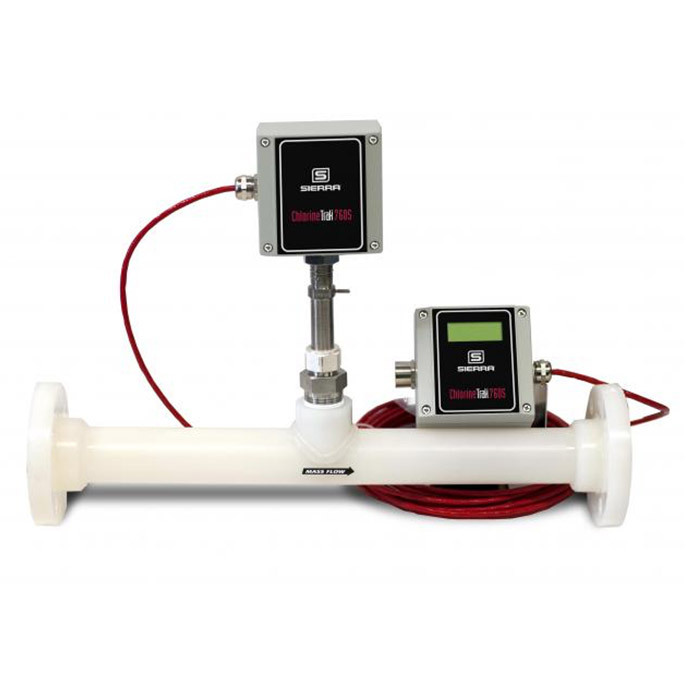 The ChlorineTrak™ 760S has been specifically designed to perform as an accurate and cost-effective mass flow measurement solution for chlorine injection processes found in typical waste-water treatment applications. All Sierra products are warranted to be free from defects in material and workmanship and will be repaired or replaced at no charge to Buyer, provided return or rejection of product is made within a reasonable period but no longer than one (1) year for calibration and non-calibration defects, from date of delivery. To assure warranty service, customers must register their products online on Sierra’s website. Online registration of all of your Sierra products is required for our warranty process. Register now at http://www.sierrainstruments.com/register. This warranty does not cover any damage or discoloration caused by corrosion due to gases, liquids, or any other source, nor does it cover normal wear of any seals in its products and with gases other than air, or unless otherwise specified in the contract. Such returns are contingent on Sierra's examination and reasonable satisfaction that any defects are covered by this warranty and that the Buyer has not returned the equipment in a damaged condition, due to any negligence, tampering, misapplication or product modification on the part of the Buyer or his agents. Sierra shall not be liable for installation charges, for expenses of Buyer for repairs or replacement, for damages from delay or loss of use, or other indirect or consequential damages of any kind. Sierra extends this warranty only to Sierra products properly used and properly installed for the particular application for which intended and quoted, and this warranty does not cover products which have been modified without Sierra's approval or which have been subjected to unusual physical or electrical stress, alteration, or tampering, or upon which the original identification marks have been removed or altered. Whenever the design of the equipment to be furnished or the system in which it is to be incorporated originates with the Buyer, Sierra's warranty is limited specifically to matters relating to furnishing Sierra equipment free of defects in materials and workmanship and Sierra assumes no responsibility for implied warranties of fitness for purpose or use. Any replacement or repair shall be to Sierra's factory, unless otherwise directed. No items shall be returned for warranty repair without prior written authorization from Sierra. Note: Sierra’s InnovaSwitch™ Flow Level Switches come with a two (2) year warranty with the above stipulations. In addition to Sierra’s standard one (1) year manufacturing warranty on all instruments produced, Sierra also offers a lifetime warranty on all DrySense™ sensors standard with Sierra models 640i, 780i, 640S, 780S, and 670S instruments sold after January 1, 2010. This warranty does not extend to the Model 620S, the BoilerTrak™, the HT (High Temperature) 640S/780S sensor or the 780S UHP (Ultra High Purity) sensors. To assure warranty service, customers must register their products online on Sierra’s website. Online registration of all of your Sierra products is required for our warranty process. Register now. Sierra offers a two (2) year warranty coverage for our entire line of InnovaSwitch™ Flow Level Switches beginning July 1, 2010. Digital communications solutions include: Foundation Fieldbus, HART, Modbus RTU, and Profibus DP. Given the corrosive nature of chlorine gas (particularly in the presence of moisture), finding an economical measurement solution posed a great challenge to the industry. To answer this challenge, Sierra has designed a flow body manufactured from Kynar® polyvinylidene fluoride resin (PVDF). This material offers excellent corrosion and chemical resistance at both ambient and elevated temperatures. PVDF is also inherently stable, mechanically tough, and abrasion and flame resistant. The 760S’s flow sensor utilizes a 6” Hastelloy® C-127 probe and 1” Swagelok® Hastelloy® NPT compression fitting to mate with the Kynar® PVDF flow body. Hastelloy C is highly resistant to pitting and crevice corrosion and is used extensively in the most corrosive environments. With its sizable turndown (100:1) and a mass flow reading that requires no pressure or temperature compensation, Sierra’s highly repeatable and stable sensor technology offers an accurate solution for chlorine flow measurement at an economical price. Sierra’s Smart Interface™ software guides you through a procedure to fully validate instrument performance and allows for field adjustment of critical flow meter settings. Our digital communications solutions offer engineers and systems integrators, full industrial system integration and networking capability with Sierra's thermal mass flow meters. Digital communications solutions include: Foundation Fieldbus, HART, Modbus RTU, and Profibus DP. This flexibility of communication features offers turnkey solutions for integration of Sierra's thermal mass flow meters into any industrial automation system or application. Sierra’s unique Steel-Trak™ sensor probe is responsible for the unsurpassed accuracy, ruggedness and reliability of Sierra industrial flow meters. The immersible Steel-Trak sensor consists of two sensing elements–a velocity sensor and a temperature sensor that automatically corrects for changes in gas temperature. When power is applied to the flow meter, the transducer electronics heats the velocity sensor to a constant temperature differential above the gas temperature and measures the cooling effect of the gas flow. The electrical power required to maintain a constant temperature differential is directly proportional to the gas mass flow rate. Both sensors are reference-grade platinum resistance temperature detectors (RTDs). The platinum RTD wire is wound on a rugged ceramic mandrel for strength and stability. Steel-Trak sensors are clad in a rugged, sealed 316 stainless steel encasement.